Whether it’s your first time in New York, or you have lived here all of your life, exploring one of the many museums is a must. However, it’s not cheap to visit these incredible institutions, with admission costing upwards of $25 at many of them. Thankfully, a lot of museums offer discounted or completely free days once per week or month. And, even better, some offer free admission every day. The monument, which is the first of its kind dedicated to Africans of early New York, contains the remains of more than 419 Africans buried during the late 17th and 18th centuries in NYC. The indoor center and outdoor memorial are always free Tuesday-Saturday. Known as Grant’s Tomb, the memorial is the final resting place of the 18th President of the U.S. and his wife Julia Dent Grant. The visitor center and memorial are free every day it’s open–Wednesday, Thursday, Friday, and Saturday. The 478-acre park is a Revolutionary War historic site and was designated a National Historic Landmark in 2006. Admission to the cemetery, which operates seasonally seven days a week, is free at all times. A home for contemporary art and ideas, the New Museum offers pay-what-you-wish admission on Thursday nights between 7-9pm. A part of the Smithsonian Institution, the museum aims to advance the knowledge and understanding of Native cultures of the Western Hemisphere. Admission is always free, open 10 am to 5 pm daily and Thursdays to 8 pm. The Brooklyn Museum is the city’s third-largest at 560,000 square feet and contains over 1.5 million pieces of art. Free on the first Saturday of the month only from 5-11pm with a 5-7pm happy hour. The Bronx Museum of the Arts is an internationally recognized contemporary art museum that connects diverse audiences to the urban experience. It is always free, with operating hours 11 am- 6 pm, Wednesday, Friday, Saturday and Sunday, and to 8 pm on Thursday. At one of the world’s preeminent modern art museums, admission is free every Friday from 4-8pm. This Queens museum remains the only in the U.S. dedicated to the art, history, and technology of the moving image. Admission is free from 4-8pm every Friday. Dating back to 1697, the farm museum occupies New York City’s largest remaining piece of undisturbed farmland. The farm grounds are open daily, year-round from 10 am- 5 pm and are always free, except during public events. The museum is the first dedicated LGBTQ art museum in the world. It’s open 12-6pm Wednesday- Sunday and 12-8pm on Thursday. Admission is free, but there’s a suggested donation of $9 per person. Daily admission BRIC House, Brooklyn’s leading presenter of free cultural programming, is free. In memorial of those who died in the Holocaust, the museum features more than 25,000 items related to Jewish history. Admission to the museum is free on Wednesday and Thursday from 4-8pm. At this spot on Wall Street, George Washington took the oath of office and was the site of the first Congress, Supreme Court, and Executive Branch offices. The memorial is open all year from Monday-Friday, 9 am-5 pm and admission is free. The cultural center promotes Greek culture through art exhibitions and events. Its operating hours vary for events, but the Olympic Tower Atrium remains open daily and admission is free. Created at the request of the Dalai Lama, the cultural center aims to preserve the unique culture of Tibet. Admission to the cultural center is free, with a suggested donation of $5, and open Monday-Friday 10am-6pm. What better location for an aquarium than beachfront in Brooklyn? The Coney Island icon, the oldest continually operating aquarium in the U.S., offers pay-what-you-wish on Wednesdays from 3 pm to closing. As the country’s first immigration station before Ellis Island, Castle Clinton welcomed more than 8 million people between 1855 and 1890. It also was formerly a beer garden, a theater and home to the New York Aquarium. The national monument is free and open every day, from 7:45 am to 5 pm. Catching up with the city’s ever-changing art scene is made easy thanks to the abundance of free artwork on display throughout NYC. While digging into the many classic art galleries of Chelsea is always recommended, the outer boroughs also offer their fair share of inspiring installations. Head to the Socrates Sculpture Park in Queens or Brooklyn’s Williamsburg Art & Historical Center for free art every day. At this acclaimed Chelsea gallery, which opened in 2002, visitors can explore the works of many European and American contemporary artists. The exhibition space is open Tuesday through Saturday from 10 am to 6 pm and is free to explore. The museum’s permanent collection includes about 50,000 garments and accessories ranging from the 18th century to present-day. Admission is free to the public Tuesday through Friday from noon to 8 pm and Saturdays from 10 am to 5 pm. Since 1971, the Japan Society Gallery has been a premier institution for Japanese art, ranging from classical Buddhist sculpture to paintings from the 21st century. It’s free Friday, 6 pm-9 pm. The spacious Soho gallery features a 22-inch deep pile of soil, weighing 280,000 pounds. See the “interior earth sculpture installation” for free Wednesday through Sunday, 12 pm–6 pm. Once an abandoned landfill and dumpsite, the waterfront sculpture park supports local artists and is an internationally acclaimed outdoor museum. The park is open and free every day, from 9 am to sunset. Current exhibits at the center, one of the world’s leading institutions dedicated to the black experience, include Black Power! and Power in Print, both exploring the art of the Black Power movement. It’s open 10 am-6 pm Monday, Thursday-Saturday, 10 am- 8 pm on Tuesday and Wednesday and closed on Sunday. Sitting right next to Prospect Park, the sprawling library presents local and international artists and their work, usually with exhibitions relating to cultural themes and books. The library is open Monday through Thursday from 9 am to 9 pm, Friday and Saturday from 9 am to 6 pm and Sunday from 1 pm to 5 pm. As the oldest and largest chapter of the American Insitute of Architects, the center hosts hundreds of free, public programs that focus on architecture, planning and design. Gallery hours are Monday- Friday, 9 am to 8 pm and Saturday 11 am to 5 pm. Known for its eclectic and thought-provoking pieces, Pierogi 2000 features the work of both new and mid-career artists. Check out the gallery Tuesday through Saturday from 11 am to 6 pm. This multifaceted art center aims to create a bridge between artists on a local and international scale. The gallery in the WAH Center (“WAH” in Japanese means “peace” or harmony”) is open Friday, Saturday and Sunday from 12 pm to 6 pm. 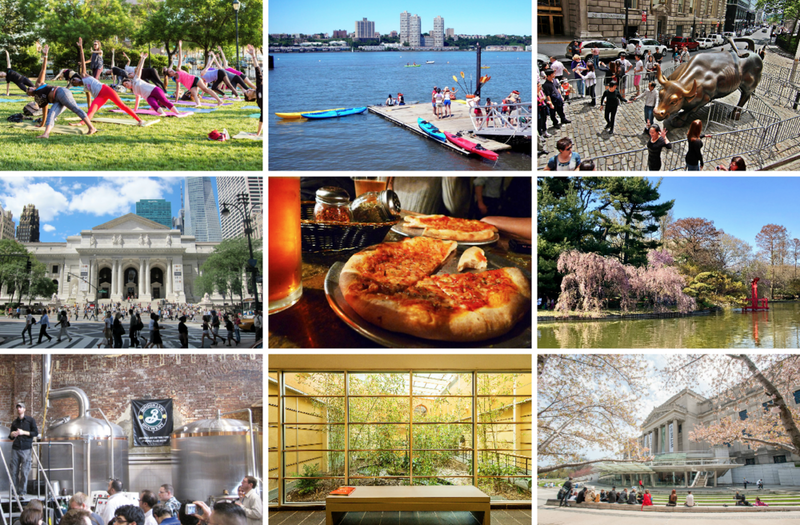 As most New Yorkers know, the best things in life are free…food. If you’re scrimping on cents until payday, try heading to one of the bars below. From complimentary-with-a-beverage pizza and Murry’s Cheese to bagels and cream cheese spread, you’ll end the month with both wallet and stomach happily full. This classic Irish pub offers a free buffet from Monday-Friday, 5-7 pm. Calling itself Brooklyn’s “original craft beer, sport’s bar and restaurant,” Croxley’s offers up classic (and cheap) pub food and lots of beers on tap. It’s known for its complimentary boneless wing buffet on Fridays, between 4 pm and 7 pm. At this Brooklyn bar, a free personal pizza comes with every drink purchase every day until 3:30 am. Complimentary food ranges from free wings on Monday to free plates of cheese and wine discounts on Wednesday. Deals happen almost every night but vary. With nearly 28 beers on tap and free cheese, you can’t go wrong at this alehouse. Complimentary cheese from Murray’s Cheese, Wednesday at 6 pm. This old-fashioned bar provides life’s simple pleasures like beer, booze, and billiards. Oh, and free cheese puffs daily. In addition to that $5 Bloody Mary, enjoy a free spread of bagels and all the fixings at Matt Torrey’s during brunch on Saturday and Sunday starting at noon. The spacious wine hub in the landmarked De Vinne Press Building provides weekly free wine tastings. Check the schedule for specific wines and other events. Like its gator sister in Williamsburg, the Crocodile Lounge offers a free mini pizza with every drink purchase. Every day. Every hour. The East Village haunt also has skee ball, trivia nights and a daily happy hour. For lovers of beer, architecture, history and everything in between, a walking tour exists. New York City, one of the easiest cities to navigate by foot, is chock full of historic and unique spots. Although some can be expensive, a lot of organizations provide free tours, requiring only a reservation. Just be sure to wear comfortable shoes and get a camera ready. A former matzo factory turned brewery, the famed Brooklyn Brewery offers free tours every Saturday 12:30 pm and Sunday at 1 pm. Visit one of the oldest continuously used City Halls in the nation that still houses its original governmental function with a public tour run by the city’s Design Commission. No reservation is required for tours on Wednesday. At the Federal Reserve, tours teach visitors about the role of the New York Fed and the Federal Reserve System in setting monetary policy and let New Yorkers explore the gold vault, 80 feet below street level. Tours require a reservation of at least 30 days in advance. Urban historians Peter Laskowich and Madeleine Levi walk visitors through the terminal’s whispering gallery, the “original” Lincoln Memorial and more. Free tours consist of 90-minute walking tours at 12:30 pm every Friday. As the flagship building of the New York Public Library, the Stephen A. Schwarzman Building boasts Beaux-Arts architecture and world-renowned collections. The library offers free tours 11 am and 2 pm Monday- Saturday, 2 pm Sunday. Learn more about the famed cathedral’s deep-rooted history in the city and explore its architectural wonders with free tours Monday through Friday beginning at 10 am. There is a suggested $5 donation for admission. Chelsea Craft Brewing, which opened in 1995, can be credited for jumpstarting the city’s brewery craze. Free tours are available Saturday, 2-6 pm, and include a free beer sample. Big Apple Greeter’s more than 300 volunteers bring roughly 7,000 visitors a year to over 100 neighborhoods throughout NYC. Reserve tours three to four weeks in advance. The walking tour stretches from St. Marks Place to Sixth Avenue, taking in sites like the residences of Lou Reed and Andy Warhol and the studios where Jimi Hendrix and Bob Dylan performed. Head to St. Mark’s Church at 11:30 every Saturday until October for the free walking tour. Free and open year-round, the Hamilton Grange National Memorial is the preserved relocated Federalist style home of Alexander Hamilton. The home was moved twice, in 1889 and 2008. Get a ranger-led tour Wednesdays through Sundays, at 10 am, 11 am, 2 pm and 4 pm. On Mondays only, visitors can explore the “people’s house,” the official house of the mayor of New York. Free tours are offered at 10 am, 11 am and 5 pm but require a reservation. As new construction and development projects continue to rise above us every day, it seems as if there’s nothing outside of this chaotic, concrete jungle. In reality, nature-filled, outdoor activities do exist in New York City that doesn’t include walking to your neighborhood’s deli. Plus, most of them are free, like the city’s public pools and parks. The all-volunteer organization is the largest free kayaking organization in the world. Find free kayaking at Pier 26 and Governors Island. At Pier 26, kayaking is offered on the weekend starting May 19 until October 8, from 9 am to 4:30 pm. On Tuesday, Wednesday and Thursday evenings, from June 19 to September 13, free kayaking is open from 5:30 to 7 pm. Without costing a penny, ride the ferry for 25 minutes from Lower Manhattan to Staten Island for incredible views of the Statue of Liberty and the NYC skyline. The fare-free ferry runs every day, making a total of 118 trips per weekday. First founded and designed by the Olmsted Brothers firm in 1910, the Brooklyn Botanic Garden is now considered a premier garden in the heart of the borough. It is free Friday between 8 am and noon and weekdays in winter. The impressive Zoo spans 265-acres free and includes more than 6,000 animals. Every Wednesday, admission is pay-what-you-wish. Open daily from April 1 to November 5 from 10 am to 5 pm. During the winter months, the zoo closes at 4:30 pm. Visit one of the greatest botanical gardens in the world, as well as the largest in any city, for free all day Wednesday and from 9-10 am on Saturday. Explore the High Line, an elevated freight rail line transformed into a public park, for free every day. Open Dec. 1- Mar. 31, from 7 am-7 pm; April 1 to May 31, from 7 am-10 pm; June 1 to Sept. 30, from 7 am-11 pm; Oct. 1 to Nov. 30 from 7 am to 10 pm. At 10 pm on the first Friday of every month, take a fun, but relaxing, bike ride through Central Park at night. While the guided bike (or rollerblade) ride is free, participants should bring their own bike, a helmet and light. Moonlight Ride offers tours all year round, but riders must reserve a spot. City Island is a small, nautical island in the northeastern part of the Bronx. For those who want to learn more about the island can take a free”land ferry” or decorated minibus on the first Friday of the month from the train station to City Island. The land ferry picks up passengers from the No. 6 train on the first Friday of the month from 5:30 to 9:30 pm every half-hour and provides free tours. To benefit from the city’s free public pools, all you need is a swimsuit. Free swim programs for youth, seniors and people with disabilities are available. Pool hours are from 11 am- 7 pm during the summer only. The city boasts over 500 miles of shoreline, as well as lakes and rivers, so there’s plenty of opportunities to fish. While it’s free to fish in every borough, city regulations must be followed. On selected weekend afternoons, the boathouse, in partnership with the Socrates Sculpture Park, provides free walk-up paddling at Hallets Cove and at Anable Basin for people of all skill levels. While the free kayaking programs are seasonal, the boathouse also has programs that promote awareness about the environment and the New York harbor. The canoe club, a totally volunteer-run organization, offers free canoe tours of the Gowanus Canal while providing a history lesson with it. In addition to canoe tours, visitors can partake in kayaking and boating in Red Hook, Brooklyn Bridge Park, Long Island City and Staten Island. The free self-guided canoe trips are first-come, first-served, but be sure to check the club’s schedule ahead of time. Discreetly tucked between two office buildings, there is a secret, totally free, elevated plaza. The hidden meadow features gardens, plants, and peace from the chaotic streets below. While eating lunch is free every day, sometimes free programs, like yoga classes, also are available. Just one-third of a mile long, this promenade has been called one of the most romantic spots in Brooklyn. With sweeping views of the Statue of Liberty, Manhattan skyline and iconic Brooklyn Bridge, the spot is priceless. And right next door, the Brooklyn Bridge offers a ton of free events daily. The 226-acre public park, one of the oldest military sites in the country, guarded New York City for over 200 years. The fort is open and free every day from dawn to dusk. Since 1979, the Urban Park Rangers program has helped New Yorkers connect with nature through public education, lectures and outdoor adventures. Rangers run various free events all year, like canoeing, family camping, hiking and fishing. Bryant Park features two state-of-the-art ping pong tables with paddles and balls, for free daily in the summer. Get your pong from 11 am to 7 pm through September 30. In the ‘city that never sleeps,’ live entertainment is never hard to find. And surprisingly, finding free events is easier than you think. There are hundreds of venues across all boroughs that offer discounted or free tickets. Watch talented performers every night of the week for free, whether it’s an improv show, an open-mic night or even a taping of Stephen Colbert’s show. The iconic Upright Citizens Brigade Theater in Chelsea closed after 14 years. But no need to worry. Free performances are still happening at UCB’s new Hell’s Kitchen location. Every Sunday, the 9:30 pm performance of ASSSSCAT 3000, a show of long-form improve, is free. Reservations are not accepted. For good food and free comedy, go to LIC’s the Creek and the Cave. The venue’s schedule is jam-packed with great shows, stand up and screenings, so there’s always something. Every day, the restaurant and bar are open late. Experience one of the longest-running drag shows in New York, with a full hour of parodies and Broadway tunes. The door opens every Wednesday at 11 pm at Industry. Every Wednesday, Lucky Jack’s offers free comedy shows at 9 pm, with no drink minimum required. With its tropical drinks and tiki bar vibe, the nearly daily free music and comedy at Otto’s Shrunken Head is just an added bonus. Otto’s remains a favorite for punk rock fans and musicians alike. The massive club, with four bars, features three levels of live music, stand-up comedy, vendors, arcade games, and private karaoke lounges. Check out the Brooklyn Bazaar’s schedule for free or super cheap nightly events. Despite being known more for its eclectic live music, the Knitting Factory also has free comedy every Sunday at 9 pm. Doors open at 6 pm and the show is first come, first served. For free, you can be a part of the studio audience for shows like the Daily Show, Good Morning America, Last Week Tonight with Jon Oliver and more. It does take some planning, so be sure to reserve them online with plenty of time before the show. In increasingly-hipster Crown Heights, Friends & Lovers has indie and island funk music, political meet-ups and old-school dance parties, most of them free. Every Monday, there’s a free comedy show at 8 pm. Once a pool-supply outlet, Union Pool has multiple bars, outdoor space, a taco truck and free shows every Monday, 10 pm. At Ear Inn, one of the oldest bars in the city, you can attend poetry readings and screenings and listen to free jazz every Sunday, 8 pm-11 pm. Pete’s Candy Store, which has always been a free venue, has booked many unknown and unsigned bands who later become famous (ie: Norah Jones). In addition to live music, enjoy weekly open-mic nights, trivia and poetry readings. As an environmental theater, the Gorilla Repertory Theater Company brings free plays to parks all over New York City. Most of the plays produced by Gorilla Rep consist of Shakespeare works, with their most famous being their long-running production of A Midsummer Night’s Dream. New York City is a great place to get fit for free. In addition to the city’s own ‘Shape Up’ initiative, which provides free drop-in classes every week, a lot of places offer once a week or once a month classes for nothing but a suggested donation. Whether you’re into running, dancing or de-stressing through group meditation, there’s a free class for you. Shape Up NYC is a free, city-run drop-in fitness program that takes across all five boroughs. No registration is required, just show up. Free classes range from Afro-Carribean Cardio to Sit and Be Fit, for all levels of fitness. Founded by the first American-born Buddhist monk to be awarded the “Geshe” title in a Tibetan Buddhist monastery, this community center provides free meditation classes offered every day, at morning and at night. At the Brooklyn Yoga School, classical yoga classes are offered for free, but do have a suggested donation of $10-20 per class. If in need of a relaxing retreat, head to Shambhala for silent, public meditation sessions. Public sittings classes are available for drop-ins every Thursday 6 pm – 7 pm, Friday 6 pm-7 pm and Sunday 9 am- 11:45 am. To set off the cost of items at the high-end athletic clothing chain, Lululemon’s new Williamsburg store offers various free events, like yoga, meditation, and cycling. RSVP for the store’s events like Workout Wednesdays and cycling tours through Brooklyn, Two Ambassadors, One Community. Rain or shine, every Wednesday from 6:30 am to 7 am, join The Rise NYC, a community-driven pop-up fitness group, for thirty-minute rotations of crunches, planks, burpees and mountain climbers. This Chelsea yoga center provides free group meditation and devotional chanting, known as Satsang, twice a week. The 90-minute free class is on Wednesday from 7:45 to 9:15 pm and Sunday at 6:15-7:45 pm. For runners looking for a less solitary experience, the NYC Fun Run club meets at a different bar in Manhattan every Wednesday at 7 pm, heads out for a run, and then meets back at the bar for a few beers. All paces welcomed, you just want to be able to make it back to the bar. Get ready to sweat it out at Hudson River Park’s 14th Street Park in free 45-minute classes every Tuesday night during the summer. Classes include dance cardio, boxing, pilates and more. Sign up online to reserve a spot. The Road Runners group, the city’s premier racing club and organizer of the NYC Marathon, offers various free events. Be sure to check out their Eventbrite first to see which running-focused classes are available and open to the public. If looking to learn something new or even sharpen a forgotten skill, you’ve come to the right place. Without spending a dime, you can listen to and engage with the brightest and most creative professionals in any field. While New York offers hundreds of readings, lectures and educational events daily, we’ve compiled some of the best that offer free or nearly free tickets frequently. The largest art museum in the United States provides free lectures through the MET Speaks program. Free lectures, which focus on current exhibitions, conservation projects and the museum’s collection, come with museum admission. Brooklyn Brainery offers cheap, crowdsourced educational classes on almost everything, from chemistry to embroidery. While most classes cost a few bucks, each month free events are offered, including free food history and science lectures. A historic NYC institution, Cooper Union, established in 1859, offers free lectures and book readings from well-known intellectuals and writers. Registration is usually required, so sign up early for every event. The Gotham Writer’s Workshop is the largest adult-education writing club in the United States. The group provides a host of free classes and workshops for those interested in memoir writing, fiction, screening and everything in between, with no registration needed. The nonprofit offers programs for those looking to sharpen their writing skills, as well as become better at teaching writing as a subject. Educators, writers and students can freely use its resource library and meeting space. This not-so-secret science club gathers monthly at the Bell House for free lectures and experiments by professional scientists. Since the club meets at a bar, the events are 21 and over. Considered one of the best bookstores in all of NYC, Three Lives, in addition to its rare collection, offers free public readings, which are always on a first-come, first served basis. This mom-and-pop bookstore has free poetry readings, lectures and other literary events perfect for every Brooklyn bibliophile. It’s open daily and operates later than most bookstores: 11 am to 11 pm. The next time you’re checking out a book at your local library, check out the free events offered at every branch. From children’s programs to arts and crafts for adults to language classes, the city’s libraries may have everything you’re looking for. The society focuses on ethics, not theology, to encourage respect for humanity and nature. Free lectures, social gatherings, and meet-up discussions are available at their 100-year old building frequently, with some costing as little as $10. Founded in 1973, the co-op provides healthy, affordable produce for members. For non-members who hope to learn more about food and the community the co-op serves, free workshops, classes and events are available.